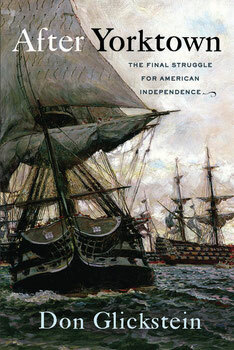 After Yorktown: The Final Struggle for American Independence (Westholme Publishing) is the story of the men who kept fighting. The popular myth is that heroic, patriotic Americans under George Washington defeated the British at Yorktown, the Revolution was over, and Americans were exceptional. But Yorktown was more a French victory than an American one. It meant the defeat of one British army, but not the British. Washington, George III, and their allies vowed to fight on. And that fighting—which expanded after the French entered the war in 1778—now spanned the world, from Hudson Bay to South America, Cape Town to Arkansas, Gibraltar to Schenectady. The only general to surrender to both Washington and Napoleon. Washington's aide (and, speculatively, Hamilton's lover) who had a suicide wish. Admiral “Satan” who nearly made India a French colony. An admiral whose greed and anti-Semitism made him a pariah—until he became a hero. Daniel Boone and how he helped botch a battle that killed one of his sons. A Forrest Gump–type British officer who almost started the Revolution and closed one of its last chapters.